Who would have guessed that this isolated region  south of Hells Canyon National Recreation Area, along the border between Oregon and Idaho  would have been such a gem to explore? I recently spent two to three weeks there with my dog, Spirit, the two of us wondering around on a motorcycle with a sidecar. (I drove.) 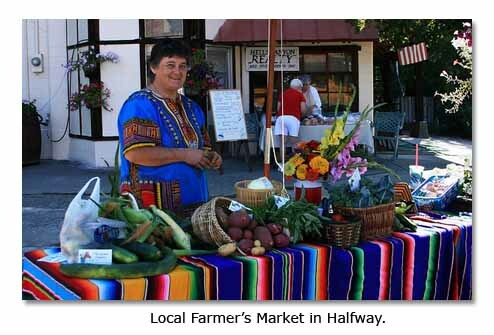 We set up camp near the community of Halfway, which has a population of 350 and a Farmers’ Market every Saturday morning. Typically, the region has hot days in summer, sometimes more than 100 degrees Fahrenheit, and lovely cool nights. It receives about 10 inches of rain a year. This compares with Portland, which gets about 45 inches per year, and the Oregon coast, with about 90 inches. Eighteen miles from Halfway, on State Highway 86 eastbound, is another little town, called Oxbow, on the Snake River, the border between Oregon and Idaho. You can follow the road, which will turn to gravel and head on to Homestead, and you will find many free campgrounds, with fire pits and clean toilets, on the way, right along the river. They are managed by the Idaho Power Company or the Bureau of Land Management. 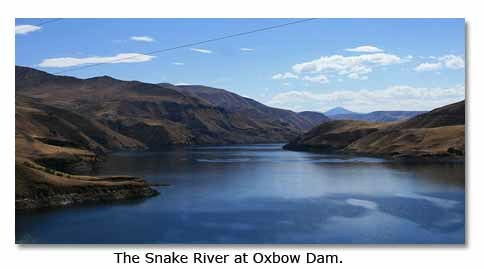 At Oxbow, you can cross the bridge over the Snake River, into Idaho, and follow Hells Canyon Road for 23 miles upstream, to Hells Canyon Dam, at the mouth of Hells Canyon. The gorge and cliffs offer great opportunities for photography. At the dam, you will find a small welcome center, which offers a selection of movies about the area. 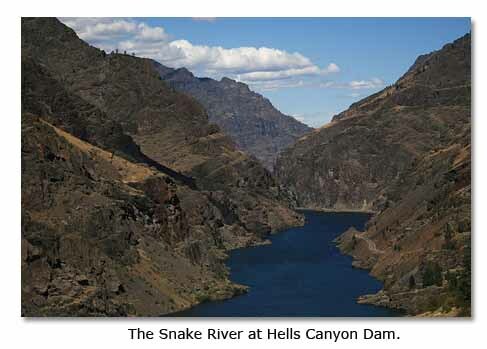 I watched a 20-minute film that covered the history of Hells Canyon, from the 1800’s, when the great Chief Joseph lived there with his Nez Perce tribe, to the 1940’s, when settlers left the area in search of better education and opportunities for their children. Returning toward Oxbow, off Hells Canyon Road, there is a dirt road going uphill called the Kleinschmidt Grade. It looks a bit intimidating, but I will say that just about any car will make it! The view is spectacular. 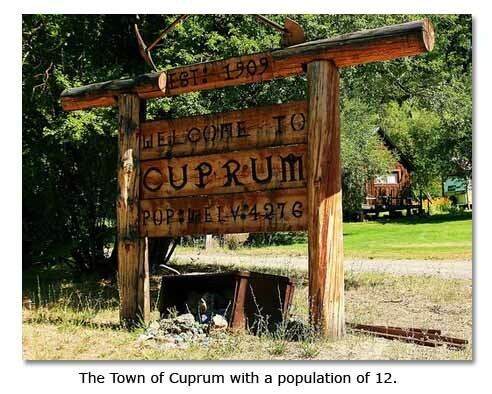 You will end up in a little town called Cuprum, which has a population of exactly 12! Back on Hells Canyon Road and continuing toward Oxbow, you will discover another route  the Cuprum-Council Road  which takes you to Council, Idaho, a town with numerous restaurants, an old square and an old train. En route, at elevations of around 4000 feet, you will find incredible views, many overlooking private ranches. From Council, Idaho’s two-lane SH 95 will take you south to Cambridge. From Cambridge, SH 71 will take you northwest and then north up the Oregon side of the Snake River back into Oxbow, completing a loop and marking the end of a fine day trip. Another road, unpaved but negotiable by automobile, will take you the 10 miles from Halfway to Cornucopia, once a mining community and now a ghost town. In the 1880s, it had a population of about 1000 miners, who took some 20 million dollars worth of gold from the surrounding hills. Today, buildings still stand on either side of the dirt “main” street, recalling horses and buggies and, probably, gunfights. The community has been virtually abandoned for the past 30 years. Still another unpaved, negotiable road will take you about 20 miles or so from Halfway to Fish Lake, at about an elevation of about 6000 feet. It offers spectacular views of the mountains across the canyon. It has an isolated and serene campground, which can nevertheless get crowded during holidays such as Labor Day weekend even though it lies 50 miles from Baker City, Oregon, and three hours from Boise, Idaho. From Halfway to Baker City, SH 86  Hells Canyon Scenic Drive  will take you through the little town of Richland, passing meadows and streams along the way. A historic marker called “Hole in the Wall” marks where a hill is moving toward the road at about one inch per week! A few miles before you reach Baker City, you will come to the Oregon Trail Informative Center, which houses extensive exhibits and information about the famous route to the West. The center has a short play, and around 4:00 pm, a volunteer tells you the history of the trail. Spirit and I feel like we have just gotten started exploring the high desert country south of Hells Canyon National Recreation Area. We are looking forward to returning to returning to the high desert country to continue our adventures.